The objective of this STP Modular Education Course on the Toxicologic Pathology of Special Senses is to educate individuals in the principles of toxicology and pathology of the special senses, focusing on the pathologic evaluation of the ocular and otic systems. Attendees will gain a solid understanding of the normal anatomy and histology of the eye and associated structures. including both theory and practical classes of current accepted terminology through GoRENI, rodent and non-rodent ocular and otic pathology, physiology and function, study requirements to assess ocular and otic toxicity, as well as discussion of gene and cell-based therapies in the eye and ear. This STP Modular Education Course will bring together attendees and subject experts for didactic lectures and practical sessions including whole-slide digital images and data sets. The format will include interactive presentations, case studies and active participation of attendees. The course will run for 2.5 days with up-to-date training in an environment that facilitates an intensive learning experience. Sessions listed are for example only and subject to change. 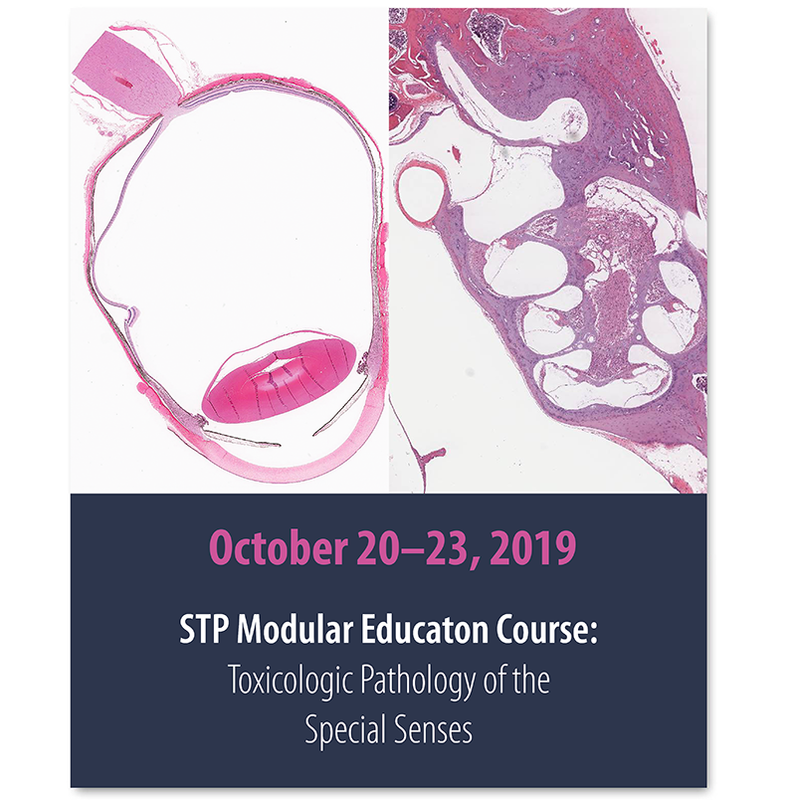 The STP Modular Education courses are designed with the novice toxicologic pathologist in mind; however, pathology residents/graduate students with an interest in toxicologic pathology or experienced pathologists who desire a more in-depth review of the special senses will also benefit from the course. The Hilton Indianapolis Hotel & Suites is centrally located in downtown Indianapolis, walking distance to shops and dining options and treasured local attractions. Save some free time after the Modular Course to visit the Indianapolis Motor Speedway, Lucas Oil Stadium, and Indianapolis Arts Garden. The Hilton is readily accessible from the Indianapolis International Airport via local taxi service or Uber. Click here for more on Maps & Directions to the hotel. The Society of Toxicologic Pathology (STP) is pleased to offer the STP Modular Course Scholarship to eligible students and trainees with demonstrated interest in the field of toxicologic pathology. This scholarship is intended to cultivate those interests by exposing trainees to in-depth applicable knowledge in subspecialties of Toxicologic Pathology, while also facilitating interactions and networking opportunities for trainees interested in pursuing a career in Toxicologic Pathology. Applications are due July 31, 2019. A written request for cancellation must be received by STP Headquarters no later than September 20, 2019. The registration fee will be refunded less a $50 processing fee. No refunds will be issued after September 20, 2019. STP reserves the right to cancel the course, in which case all registrants will receive a full refund. For any questions please contact STP Headquarters. If you have any special needs or special dietary requirements, please inform the STP modular course organizing committee at least three weeks in advance of the event. *A letter of verification from a department chair must accompany student registration. The objective of this Society of Toxicologic Pathology (STP) modular course is to educate individuals in the principles of toxicology and pathology of the gastrointestinal and exocrine pancreas system. The STP course will brought together course attendees and world renowned subject experts for didactic lectures and practical sessions including whole-slide digital images and data sets. The course was held over three days in an environment that facilitates an intensive learning experience. Melissa Schutten, DVM, PhD, DACVP, Genentech, Inc.
Dr. Lauri Diehl, Genentech, Inc.
Dr. Steven Laing, Genentech, Inc.
Dr. Leah Schutt, Genentech, Inc. This program (56-34344) is approved by the AAVSB RACE to offer a total of 17.50 CE Credits (17.50 max) being available to any one veterinarian: and/or 17.50 Veterinary Technician CE Credits (17.50 max). This RACE approval is for the subject matter categories of: Category One: Scientific Category Two: Non-Scientific-Clinical using the delivery method of Seminar/Lecture. This approval is valid in jurisdictions which recognize AAVSB RACE; however, participants are responsible for ascertaining each board’s CE requirements. RACE does not “accredit” or “endorse” or “certify” any program or person, nor does RACE approval validate the content of the program. The objective of this Society of Toxicologic Pathology (STP) modular course is to educate individuals in the principles of toxicologic pathology of the respiratory system. The STP course brought together attendees and world renowned subject experts for didactic lectures and practical sessions including whole-slide digital images and data sets. The course was held over three days in an environment that facilitates an intensive learning experience. Practical evaluation and interpretation of toxicologic pathology data was emphasized. This program was submitted for continuing education credit in jurisdictions which recognize AAVSB RACE approval; however, participants should be aware that some regulatory boards have limitations on the number of hours accepted in certain categories and/or restrictions on certain methods of delivery of continuing education. The objective of this Society of Toxicologic Pathology (STP) Modular Education course is to educate individuals in the principles of toxicologic pathology of the hepatobiliary system. The STP course will bring together course attendees and world renowned subject experts for didactic lectures and practical sessions including whole-slide digital images and data sets. The course will be held over three days in an environment that facilitates an intensive learning experience. Practical evaluation and interpretation of toxicologic pathology data will be emphasized. This program will be submitted for continuing education credit in jurisdictions which recognize AAVSB RACE approval; however, participants should be aware that some regulatory boards have limitations on the number of hours accepted in certain categories and/or restrictions on certain methods of delivery of continuing education. The objective of this Society of Toxicologic Pathology (STP) modular course is to educate individuals in the principles of toxicologic pathology of the cardiovascular system. This program 56-23891 is approved by the AAVSB RACE to offer a total of 21.00 CE Credits (21.00 max) being available to any one veterinarian: and/or 21.00 Veterinary Technician CE Credits (21.00 max). This RACE approval is for the subject matter categorie(s) of: Category One: Scientific Category Two: Non-Scientific-Clinical using the delivery method(s) of: Seminar/LectureLab/Wet Lab. This approval is valid in jurisdictions which recognize AAVSB RACE; however, participants are responsible for ascertaining each board's CE requirements. The objective of this Society of Toxicologic Pathology (STP) Modular Education course is to educate individuals in the principles of toxicologic pathology of the immune system. This program has been approved for 18.5 hours of continuing education credit in jurisdictions which recognize AAVSB RACE approval; however, participants should be aware that some regulatory boards have limitations on the number of hours accepted in certain categories and/or restrictions on certain methods of delivery of continuing education. The objective of this Society of Toxicologic Pathology (STP) Modular Education course is to educate individuals in the principles of toxicologic pathology of the reproductive system. This course is modeled on the highly regarded and successful British Society of Toxicological Pathology (BSTP) Modular Education courses. Similar to the BSTP courses, the STP course will bring together course attendees and world renowned subject experts for didactic lectures and practical sessions including whole-slide digital images and data sets. The course will be held over three days in an environment that facilitates an intensive learning experience. Practical evaluation and interpretation of toxicologic pathology data will be emphasized. This program has been approved for 22.5 hours of continuing education credit in jurisdictions which recognize AAVSB RACE approval; however participants should be aware that some boards have limitations on the number of hours accepted in certain categories and/or restrictions on certain methods of delivery of continuing education. The Society of Toxicologic Pathology (STP) is offering the inaugural course in the Modular Education Series which will focus on Neuropathology. The first course is planned in partnership with the British Society of Toxicological Pathology (BSTP) and with help from the STP Special Interest Group in Neuropathology (SIGN). The BSTP has offered a Modular Education Series for many years offering two to three courses a year focusing on specific organ systems. In bringing these modular courses to the United States, the STP will offer these same opportunities to pathologists who might not otherwise be able to attend those offered by the BSTP. These courses will include both didactic lectures and practical data and slide review sessions. Microscopic evaluation of histologic sections will be done using whole-slide digital pathology images and practical evaluation/interpretation of toxicologic pathology data will be emphasized. This program has been submitted (but not yet approved) for 21 hours of continuing education credit in jurisdictions which recognize AAVSB RACE approval; however participants should be aware that some boards have limitations on the number of hours accepted in certain categories and/or restrictions on certain methods of delivery of continuing education.